Antelope Audio has introduced the Edge Go, a bus powered microphone designed to work with the company’s real-time FPGA FX emulations platform. Antelope Audio’s Edge Go is a studio-grade, large-diaphragm condenser USB microphone that provides producers, musicians, podcasters, music vloggers and tech reviewers with access to Antelope’s industry-leading microphone-modeling technology. 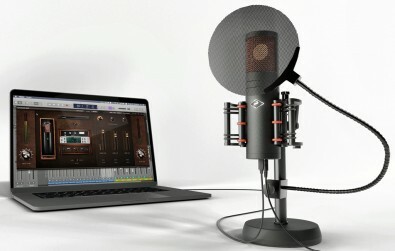 The Edge Go offers a locker full of classic vintage microphones on a personal computer. Plug-in the USB-equipped Edge Go directly into a Mac or PC, launch the included Edge Go software application start recording. There is no need for an external preamp, mixer or audio interface. Edge Go functions as an audio interface in its own right, offering pristine A/D conversion with up to 192 kHz/24-bit resolution. The new mic comes with the Edge Go control panel software, so users can instantly audition and compare 11 emulations modeled on time-tested studio microphones making their musical mark on thousands of hit recordings. From fat-sounding tube mics (like the Tokyo 800T, Berlin 49T, Berlin 67, and Vienna 12) through to crisp FET condensers (like the Berlin 87, Berlin M103, Berlin 47 FT, and Vienna 414) and beyond into the realms of smooth ribbons (like the Sacramento 121R and Oxford 4038). Once the mic emulation is selected, the pickup pattern is selected. It can be omnidirectional, cardioid, bidirectional, figure-8 and anything in between. Users can also choose to record through the Edge Go microphone with no mic emulation applied for a transparent, flat 20 Hz - 20 kHz large-diaphragm sound. The emulation software collectively cover all bases with must-have preamps, dynamics processors (including limiters, compressors, gates, and expanders) and a de-esser — namely, PowerGate, PowerEx, VEQ-1A, VEQ-HLF, BAE-1073, VEQ-55A, Lang-PEQ2, VEQ-4K BLACK, Master De-esser, BA-6A, FET-A76, VCA160, Liverpool, Stay-Levin, ALT-436C, Gyratec IX, VPA 76, BAE-1073MP, RD-47, and BA-31 — alongside Antelope Audio’s AuraVerb. The system features six reverb types and a reel-to-reel tape effect to recordings a distinctively vintage vibe. There’s one-click access to presets like telephone effect, massive reverb space and fan noise reduction. No DAW is needed. Add headphones, a USB input- equipped computer, and audio software of choice. Edge Go is priced at $1,595.